There are many theories on who the Pharaoh of the Exodus was. While some look to archaeology for the answer, the Bible provides very clear clues on his identity. 1. Now Joseph had been taken down to Egypt; and Potiphar, an Egyptian officer of Pharaoh, the captain of the bodyguard, bought him from the Ishmaelites, who had taken him down there. 2. The LORD was with Joseph, so he became a successful man. And he was in the house of his master, the Egyptian. 3. Now his master saw that the LORD was with him and how the LORD caused all that he did to prosper in his hand. 4. So Joseph found favor in his sight and became his personal servant; and he made him overseer over his house, and all that he owned he put in his charge. Many are familiar with Joseph who as the youngest and favored son of Judah boasted of his special status. In a jealous rage, the brothers sold Joseph into slavery to a passing band of Ishmaelites (Genesis 37), who in turn sold Joseph to Potiphar — the captain of the guard in the Egyptian Pharaoh’s court. From this lowly slave position, Joseph rose to second in command in Egypt. But as we read this passage something very strange pops out. Three times in five verses Potiphar is described as Egyptian – “an Egyptian officer” (v 1), “the Egyptian” (v. 2) and “the Egyptian’s house” (v. 5). Anyone reading this passage would instinctively presume Potiphar was Egyptian without it being mentioned even once. So, why did Moses go to such lengths to describe Potiphar’s Egyptian heritage? The reason is obvious: because the fact Potiphar was Egyptian is what was unusual and Moses wanted to emphasize this fact. Around 1800 BC, a group known as the Hyksos — taking advantage of political upheaval in Egypt — invaded the Nile delta. Archaeological records show the Hyksos incorporating such military innovations as a composite bow and horse and chariot had a significant advantage over the Egyptians. The Hyksos were also Semitic making them cousins of Judah and his family. (Some suspect they were descendants of Esau — Edomites). They spoke a similar language to the Hebrews. There would be differences of course (words and accents), like we see between those living in Scotland/England, US, Canada and Australia. This passage in Genesis suggests when Joseph arrived the Hyksos were ruling Egypt and that’s why it was so unusual to have an Egyptian guard. The Hyksos never fully conquered Egypt. They occupied the northern half of the Nile delta setting up their capital in Avaris where many Egyptians still remained. Meanwhile, the Egyptian government consolidated in the south. The conquerors adopted the Egyptian governing style and even incorporated their titles referring to Hyksos rulers as Pharaoh. They allowed Egyptian to remain the language of the nation and integrated many Egyptian customs and gods into Hyksos culture. It is similar to Germany’s occupation of France in World War II – where the majority of the French accepted occupation and went on with their lives. But beneath the outward veneer there remained a hostility towards the occupiers. Some, known as the resistance, continued their fight against the Nazi occupiers. However, some French took a different stance and collaborated with the Germans. The Nazi Gestapo boasted each morning the postal bin of their Paris HQ was full of letters from individuals accusing fellow citizens of resistance to the Germans. We see that a handful of Nazi were able to control France by using the French police to enforce German rule during their occupation. This is exactly what happened in in Egypt, the Hyksos pharaoh used Egyptians to provide police protection. Potiphar’s connections to the Egyptian community was invaluable for rooting out potential threats. With the Hyksos occupation as a backdrop, a number of verses surrounding Joseph’s story now make sense. How could a slave in any fashion mock (make sport of) his Egyptian masters? Notice as well how she said “us.” She said Joseph was an insult not only to her but the whole Egyptian household including servants. It happened because of Joseph’s close association with Egypt’s occupying masters. Being Semitic like the Hyksos, he was a constant reminder of Egypt’s servitude. It demonstrates how closely Potiphar’s wife linked Hebrews and Hyksos. It is equally apparent Potiphar’s collaboration with the Hyksos was not viewed positively even by his own family. The Hyksos connection explains how under God’s anointing Joseph easily ascended to second in command in the Egyptian government. There would have been minimal language differences and an inherent level of trust. Because of Joseph’s favorable service and the fact he was kin, Pharaoh allowed Joseph’s family to settle in prime land around Goshen (Genesis 47:11, 27). It also explains why the Ishmaelites who were also Semitic were heading to Egypt to trade, they were wheeling and dealing with family. Finally around 1500 BC, the Egyptians — under Amhose I – mustered a military (which now included chariots Exodus 14:23) powerful enough to drive the Hyksos out of Northern Egypt. Moses then explains this difference – the “new” king “did not know Joseph.” Joseph had died hundreds of years earlier so it didn’t matter who came to power, no one would have personally known Joseph. So this phrase was referring to something different – there was no family connection with the New Egyptian pharaoh as there was with the old Hyksos regime. This new king was undoubtedly Amhose I — who having driven out the Hyksos — takes a very adversarial approach to the Israelis. Amhose was nervous about the growing Jewish population in Egypt. He was concerned if the Hyksos launched a counterattack, the Jews who were close kin would ally with Egypt’s dreaded foe. Over the next few decades, Amhose, and the pharaoh(s) that followed, put the Hebrew under intense pressure. It was during this oppression, the Israelis called out to Jehovah for a deliverer. There had to be more than one Pharaoh to cover the time period between the Hyksos defeat and the Jewish exodus, because the time frame covered the persecution of the Jews, Moses’ birth, his growth to a young man in the Egyptian family, murder of the Egyptian guard, exile, and eventual return. In fact, Exodus 7:7 says that Moses was 80 years old when they started talking to the Pharaoh. But it is also important to realize that people were still living longer at this point — Moses died when he was 120 years old and Aaron when he was 123. So who was the Pharaoh of the Exodus? 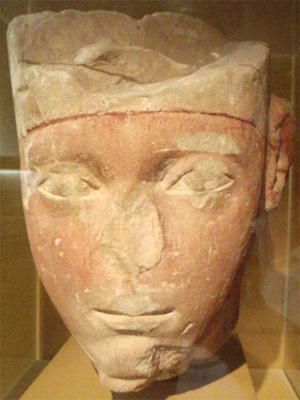 Though everyone was living longer, a good possibility is Amhose’s son, Amenhotep I. It is even possible that the plagues started with Ahmose and ended with Amenhotep. In his article, Amenhotep, the Second King of Egypt’s 18th Dynasty, Jimmy Dunn writes similar to his father, Amenhotep was very active building temples along the Nile, including finishing off many projects initiated by his father. This lines up with the Biblical narrative that says Jacob’s heirs supplied building materials for at least two pharaohs (Exodus 1:11 and then again after Moses’ return from exile Exodus 5:6-11). We see God’s stamp during this period of Egyptian history. God raised up the Hyksos to overthrow the Egyptian government preparing a safe haven for the Israelis to prosper and grow. But just as clearly, Jacob’s heirs had become too comfortable in their adopted land and may never have left and the Egyptians were allowed to regain control. The resulting persecution pressured the Israelis to leave and ultimately fulfill their destiny in the Promised Land. Joseph was not the youngest,Benjamin was the last child born to Isreal.If I’m understanding your initial statement correctly.